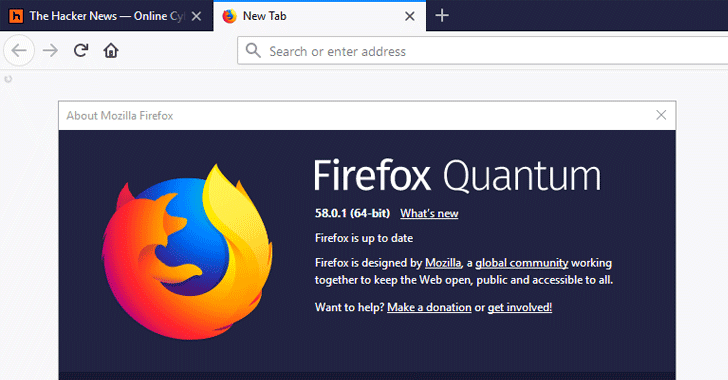 The update comes just a week after the company rolled out its new Firefox Quantum browser, a.k.a Firefox 58, with some new features like improved graphics engine and performance optimizations and patches for more than 30 vulnerabilities. According to a security advisory published by Cisco, Firefox 58.0.1 addresses an 'arbitrary code execution’ flaw that originates due to 'insufficient sanitization' of HTML fragments in chrome-privileged documents (browser UI). "A successful exploit could allow the attacker to execute arbitrary code with the privileges of the user. If the user has elevated privileges, the attacker could compromise the system completely," the advisory states. This could allow an attacker to install programs, create new accounts with full user rights, and view, change or delete data. However, if the application has been configured to have fewer user rights on the system, the exploitation of this vulnerability could have less impact on the user. Affected web browser versions include Firefox 56 (.0, .0.1, .0.2), 57 (.0, .0.1, .0.2, .0.3, .0.4), and 58 (.0). The vulnerability has been addressed in Firefox 58.0.1, and you can download from the company's official website. The issue, which was discovered by Mozilla developer Johann Hofmann, does not affect Firefox browser for Android and Firefox 52 ESR. Users are recommended to apply the software updates before hackers exploit this issue, and avoid opening links provided in emails or messages if they appear from suspicious or unrecognized sources. Administrators are also advised to use an unprivileged account when browsing the Internet and monitor critical systems.